I personally love soups and I generally have a cup of soup almost every day. The reason I love having soup is pretty simple, soups are really very healthy and when it comes to losing weight in a healthy manner, soups are the must have diet. If you are serious about weight loss and wondering what all nutritious and healthy foods you should be eating to lose weight fast, then consider including soups in your meal. Today, I am sharing a list of 15 light and healthy soups for weight loss. The soups I will be talking about are healthy, nutritious, easy to make and tastes great. What is most interesting about soups is that, it is probably one of the few foods where you do not have to mix too much of spice or oil. It’s quick and easy to prepare and mixture of the varied ingredients will ensure a unique flavor which in most cases, turns out to be really very tasty. Most of soups are really light but at the same time, they successfully satisfy our hunger cravings. In short, by having soups, you do not gain much of the daily calories but still manage to keep yourself full for a long time. Isn’t it just great? Well, I think you will agree to it and so you must seriously consider to add it in your day to day diet, especially so if you are working on losing weight. Whether you eat the soup as your breakfast or include it in your dinner or lunch, the choice is yours. But the inclusion of the healthy soups is a must if you are want to lose weight fast and in a healthy manner. Obesity or being overweight is a serious health problem and it can actually lead to several other health problems as far as scientific studies are concerned. So, the faster you start your weight loss journey, the better for your health and wellbeing. In addition to the health issues, being overweight can actually put an individual into severe depression. He/she may face severe bullying which may lead to extreme low confidence, that in turn may force him/her to taking wrong decisions in life or to be more specific, inflicting self-harm. But you will have to take the negativity and make it your strength and fight back. And, for that, you need to get involved in regular exercises and maintain a good healthy diet. 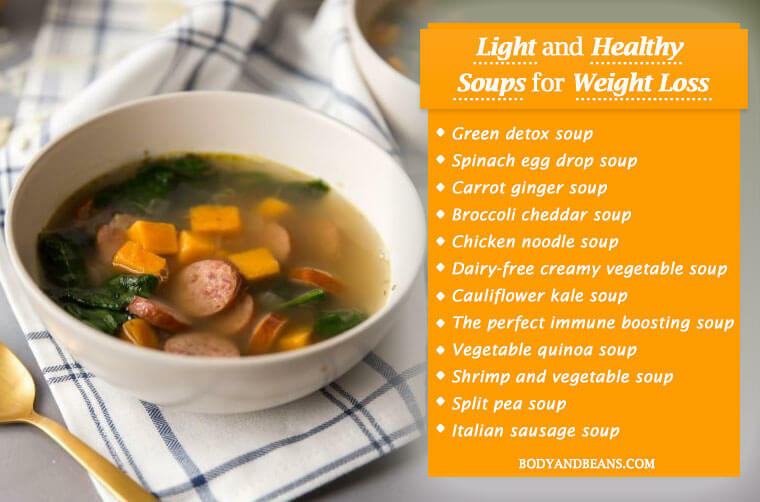 And, to speed up your weight loss journey, you may like to include these light and healthy soups for weight loss and lose weight naturally. Obesity is increasing on an alarming rate and it is important for us to eat right to stay fit and healthy. Since soups fall in the list of healthy foods with low calories, it is important for each one of us to know specifically which soups are best when it comes to weight loss. So, without wasting much time, let us begin with the discussion. 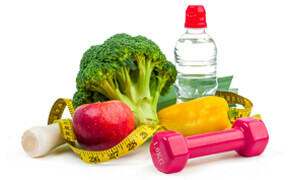 Eating right has always been the basis of healthy living and it is also closely related with effective weight loss. And, so you need to include food items that are healthy, contain less calories as well as satisfy your taste buds and keep you full for long. Now, soups serve all of these criteria and it is definitely a must have meal option for effective weight loss. Listed below are the most nutritious, light and healthy soups for weight loss worth eating. Fresh green vegetables are always recommended for healthy living and effective weight loss. But to turn things a little tastier and to keep the nutrition value intact, you may like to make a soup using your favorite healthy vegetables. This soup can be prepared with spinach, avocado, zucchini and little bit of apple cider vinegar. The most interesting part is that you can make it very light using water as well as add to its richness using yeast and coconut milk. I can guarantee that green detox soup will be super tasty, very filling as well will help you maintain your body weight and lose the extra kilos. So, this soup is definitely among the best light and healthy soups for weight loss. Taking this soup can help you lose weight fast and hence it’s a must try. Eggs are very tasty and already the favorite of many but sadly even though spinach is very nutritious, many do not like adding it much in their diet. So, what you can do is to make a soup out of the two so that the taste comes out to be great as well as the nutritional value of spinach is also not compromised. Spinach egg drop soup is super easy to make. You just have to do a bit of stirring with the beaten eggs in the boiling pot and then add spinach to it. If you want to increase the taste a bit more then you may add some carrot pieces and a little bit of tomato sauce to it as well. The simple carrot ginger soup is a favorite among many and needless to say, it has got several health benefits with effective weight loss being one of them. The soup is packed with carotenoids and has got anti-inflammatory properties which helps in strengthening your immune system. And, when this happens, your body gains the strength to fight diseases like various flus as well as you gain the motivation and the vigor to do more workouts and lose more weight. In addition, carrot ginger soup is also quite light and so you will not be gaining much of your calories if you add it in your food chart. Carrot ginger soup is very tasty, but if you want to soothe your taste buds even more, then you may like to add a little bit of golden raisins and make it your favorite cold winter day soup for weight loss. Mostly in case of broccoli cheddar soup, the cheese content is higher than broccoli but if you are to lose weight effectively, you will simple have to do the reverse. To be more specific, your broccoli cheddar soup must contain high amount of broccoli and then you can add little bit of cheddar for the creamy rich texture and a bit of beer (it is preferable if you go for full-flavored ale like bass) to complete it. Do try out this soup as it is super beneficial. Chicken noodle soup is quite a popular soup and if you know how to make it healthy by adding proper healthy ingredients and in perfect quantity then it will become the best soup for weight loss. Your version of the chicken noodle soup must contain shredded chicken, noodles, onion, garlic, chicken stock (low sodium) and a lot of vegetables like carrots, celery, parley etc. Needless to say, the taste will be awesome and it will keep you full for long. Also, the fewer amounts of sodium and the veggies will help you lose weight healthily. I would like to request you guys to completely avoid the canned chicken soups found in market and instead make fresh soups on your own. This is because the canned ones contain too much of sodium and the quantity of healthy chicken and vegetables are very less, so naturally they have got minimum health benefit. At first look you may get terrified if I tell you to eat it for effective weight loss. This is not your fault because the velvety thick soup gives an impression on others that there is too much of cream, pureed nuts or too many potatoes in it, all of which contains lot of calories. But trust me; the soup contains none of it. This creamy vegetable soup is very healthy, nutritious and light. You get the creamy look when you blend a lot of non-starchy veggies like cauliflower, broccoli, yellow squash, zucchini, onion, garlic and a little bit of olive oil. So, undoubtedly, this soup is both tasty and healthy and is great to keep you full as well as keep your calorie intake in control. Two nutritious vegetables when mixed together gives a soup that is at its best when it comes to health benefits which certainly include effective weight loss as well. The soup looks like an irresistible creamy concoction, thanks to the cauliflower for the perfect texture and the kale for giving it the rich green color. Cauliflower kale soup is a very healthy soup, and you can easily drink it every alternate day to balance your calorie intakes. From its very name, you can understand its significance as far as healthy living is concerned especially when it comes to weigh loss in healthy way, as well as satisfying the hunger cravings. This tasty light soup is made with ingredients like kale, garlic, turmeric, shiitake mushrooms, bokchoy, and coconut oil and contains almost every important nutrient that will benefit you in fighting the pathogens; hence it is considered as the perfect immune boosting soup. But it’s equally effective in weight loss and you can add it your everyday diet. The health benefits of quinoa is not unknown to us thanks to the various studies done on it. Now, when you add some more healthy vegetables to it, the benefits manifold. Here, in the vegetable quinoa soup, besides quinoa, you will need carrot, celery, vegetable broth, parsley/cilantro, garlic and olive oil to add on to the antioxidant potential and nutritional benefits of the soup. An actual and good French onion soup takes a lot of time to prepare and includes many ingredients which are not that beneficial for an individual who is desperately trying to lose weight, so we give a twist and present before you an easy French onion soup option that will be both tasty as well as healthy. For preparing a healthy French onion soup which is just great for effective weight loss, you will require some low-sodium beef broth/chicken broth/vegetable broth, sourdough bread or baguette, onions, red wine, salt and a little bit of Swiss cheese. All of these ingredients will give you a great soup which will not add too much of calories, but can keep you full for long. Mostly people eat it as a vegetable soup meant for effective weight loss but if you want to add a bit of non-veg flavor to it, then you can always add few shrimps in it and change the flavor of the soup without adding too much of calorie content in it. It will also improve the protein content of the soup and add some bulk to it. The ingredients required to make this soup are shrimps, ivy gourd, radish, spinach, taro root, turmeric, ginger and dried seaweed. 2 bowls of this soup along with little bit of salad will be enough for your lunch. If you consider a vegetable soup, then butternut squash soup is one of the best light and healthy soups for weight loss. I mean the combination of butternut squash along with other ingredients like grated nutmeg, minced ginger, peeled and chopped green apple, olive oil, light sour cream (optional), little salt and black pepper is unbeatable. Besides satisfying our taste buds, the soap is packed with important nutrients like fiber, Vitamin A, omega-3s, all of which are very much essential for an effective weight loss. However, if you want to add the non-veg element to it and make it a proper full meals, then you are open to add 2 bacon strips, low sodium chicken broth and some diced small onions. Needless to say, that the taste factor will increase by several counts after adding these ingredients. Split peas are great as far as health benefits are concerned especially when it comes to effective weight loss, thanks to the rich content of fiber, Vitamin B and other healthy nutrients in them. But when they are combined with a little bit of smoky ham and put into a slow simmer, the results are magical. Peas slowly break down, mingle with the ham and create a creamy thick broth that keeps you warm and charged up during the tiring time or during the cold winter days. To make this delicious and healthy split pea soup, you need celery, onions, carrots, garlic, chicken or vegetable stock, red potatoes, bay leaves and black pepper along with split peas and ham. The soup is enough to satisfy your hunger cravings as well it will not add too much of calories to your body. If you love the taste of the tomatoes and want to use it for weight loss, then the gazpacho is certainly the best ingredient for you. It will also help you beat the summer heat by keeping your system cool. And, as far as gazpacho goes, besides the nutritious tomato, you will have other healthy ingredients as well which will together make the soup very tasty and healthy. The other ingredients required to make this soup are green bell pepper, red onion, cucumber, lemon, olive oil, red wine vinegar, garlic and salt. Italian sausage soup is simple but it is equally beneficial for you to lose weight effectively and hence it deserves a mention in today’s list. You will get a bowl of meat, pasta and vegetables which will give a great taste and many health benefits. You may load your Italian sausage soup with much more vegetables if you want to make it healthier. This will turn out to be a good dinner for you and will definitely prevent you from gaining weight. To make the soup, you will require Italian-style turkey sausage, olive oil, yellow onion, garlic, red pepper flakes, tomatoes, low sodium chicken broth, pasta, and green beans. Over to you: which is your favorite soup for weight loss? A healthy diet means a diet which contains the nutrients required by your body in the amounts in which they are required. Any excess or deficiency of vital nutrients can impact your health badly and that’s why it is important to eat a balanced diet to leave a healthy life. Now, when it comes to weight loss in a healthy manner, crash dieting is out of question as it makes the body extremely weak and is also not good for your health in general. So, eating too less or skipping meals is a complete no. Hence, what you have to do is to have such foods that will give your body strength, satisfy your hunger as well as not let you gain unnecessary extra kilos. And for that, the best option to go for is to include light and healthy soups in to your everyday meal. I have already shared a list of 15 of the most light, nutritious and healthy soups for weight loss in healthy ways. All these soups include ingredients which are great in keeping you fit, strong and healthy. These are actually proper meal options, so basically your body will get the nutrients and at the same time, it won’t overstuff you with calories. All of these are quite light, so may like to give it a try, irrespective of whether you want to lose weight or just want to keep your weight in check. Needless to say, in order to lose weight, besides having proper diet you need to follow discipline, especially when it comes to eating and working out. That includes avoiding unhealthy foods, eating mindfully and doing regular exercise. See, if, in one hand, you are trying to eat healthy but at the same time you are unable to control the greed of eating unhealthy foods like oily, spicy, fatty, sugary ones, then all of your efforts will eventually go in vain. So mindful eating is seriously important to lose weight in a healthy way. Discipline also requires that you will have to hit the gym regularly as that will help you burn the excess body fat and keep you fit. However, if you are not much OK with rigorous workouts then, go for the basic stretching or yoga as they are equally beneficial. And, if you want to make your weight loss process more enjoyable, then get involved in physical activities like swimming, cycling, tennis, football etc. because these games or activities will eventually keep you fit as well as you will never get bored doing these. You must also go for daily morning and evening walks or run and continue for at least 20 minutes. It is also important to have your meals on time, go to sleep and get up on time. How do you maintain your weight? What else do you think one should eat and do to lose weight in a healthy way? Feel to share your tips and hacks by commenting below.